Shannon, Joseph (compiler). Manual of the corporation of the city of New York (1868) Common Council, New York, NY. Printing House Square, across Park Row from City Hall Park, was a concentrated hub of newspaper publishing from the 1840s. The location took advantage of the proximity to the political news of City Hall and the courthouses, as well as to easy access to the city's main post office, first on Nassau Street, then from the 1870s, at the southern triangle of City Hall Park. When this hand-colored etching was featured in Shannon's Manual in 1868, the five-story masonry New York Times Building was the most prominent edifice on the square. Commissioned by the New-York Daily Times (later the New York Times), this was the first building specifically designed for the integrated production of newspapers, setting the Times apart from its competitors, who continued to operate out of generic commercial buildings along Park Row and Nassau Street. Printing presses in the basements were evidenced by the black smoke rising from the chimneys and the signs stretching across the fa�ade of The Sun in the lower illustration advertising "Steam Job Printing House," indicating that special order printing was offered on site. 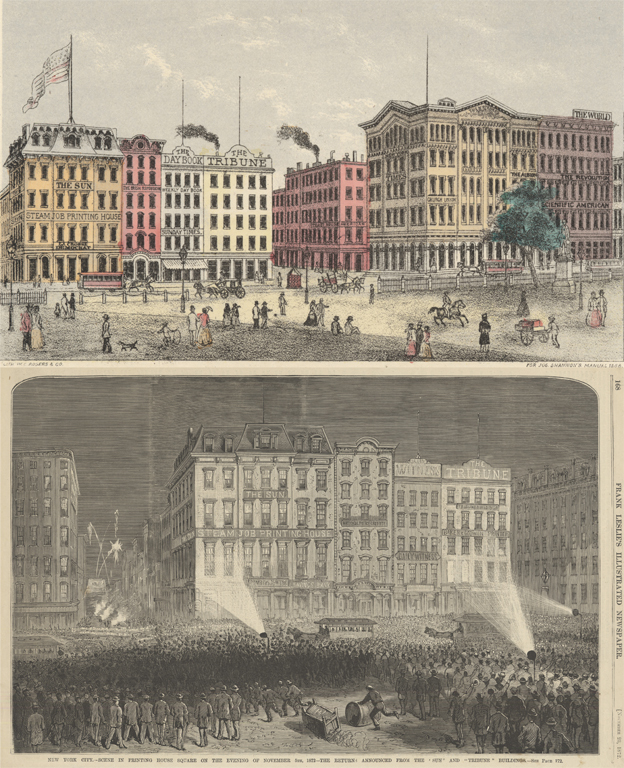 The importance of Printing House Square as a center for up-to-the minute information where crowds gathered to learn breaking news and celebrate public events is also made clear in the illustration of the night view of the election returns of the presidential election of 1872. Bulletins informed the reelection of Ulysses S. Grant and defeat of Horace Greeley, the founding editor of the Tribune, who died in a sanitarium later in November. Shortly after this image appeared in Frank Leslie's Illustrated Magazine, the three buildings pictured to the right of The Sun building were demolished and replaced by the eleven-story Tribune Building. A Tower to "Wake Up the Nation"